Is there 'more than meets the eye' when it comes to Activision's latest movie tie-in, or does it replicate the slightly disappointing feel of the big-budget movie it's based on? If you happen to be a child of the 80s then the appeal of Transformers shouldn’t need any explanation. The seminal early morning cartoon series - coupled with a near-legendary animated movie and fantastic toy line - gave birth to a whole generation of dedicated fans. 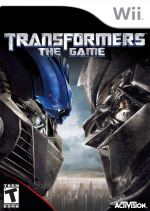 The franchise has grown over the years and Michael Bay’s recent live-action movie version has prompted a welcome resurgence in the popularity of the robots in disguise. Somewhat predictably, this has in turn led to the development of a licensed videogame adaptation. With Bay’s movie managing to both entertain and disappoint in almost equal measures we have to admit we didn’t have particularly high hopes for the game here at NintendoLife. There were reasons to be optimistic, however – developer Traveller’s Tales (Lego Star Wars, Sonic R, Wiz 'n' Liz) have a good track record, and the core concept – gigantic shape-shifting robots fighting it out over a destroyable cityscape – certainly has appeal. 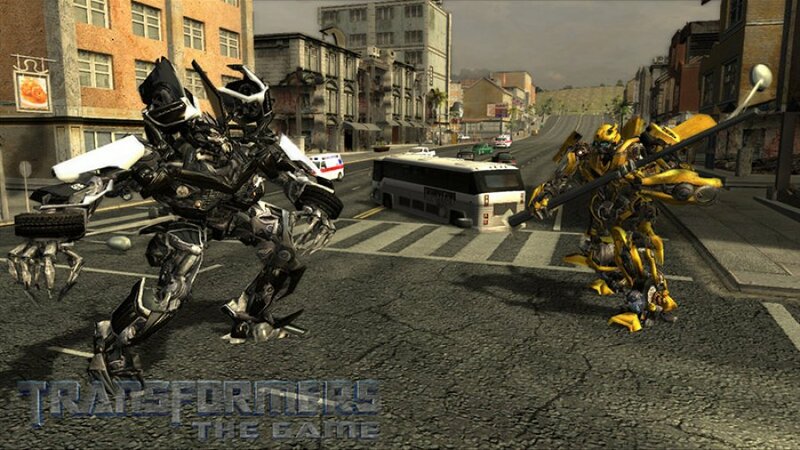 Graphically Transformers is more than adequate. The robot models are packed with detail and animate well – transformations are particularly satisfying to watch. The city itself is less impressive – the grime-covered environs of the ageing GTA3 are arguably more intricate and impressive than the ones found here. Weapon effects are nicely handled, and when you become embroiled in an epic firefight the screen lights up like a malfunctioning Christmas tree, with laser bolts ricocheting off walls and buildings and higher calibre projectiles causing massive mushroom-cloud explosions. Predictably the Wii version is left standing in the shadow of the more graphically adept 360 and PS3 editions, but the gulf isn’t as huge as you might expect. Sadly, all three versions share the same cringe-worthy pre-rendered cut scenes. These appear in-between missions to help the story progress and despite the involvement of several key actors from the film (including Peter ‘Optimus Prime’ Cullen) they have a very ‘last-gen’ feel to them, looking rushed and half-finished at times. The promotional material for the game makes a lot of fuss about the ‘innovative’ option to pick sides and play as either Autobots or Decepticons. The two factions have different missions and characters as you might expect, but both are ultimately seeking to gain control of the Allspark – a powerful artefact that is the source of all ‘Transformer’ life. The heroic Autobots are keen to protect humans and even go as far as to enlist their aid in order to gain the Allspark; the malevolent Decepticons are quite comfortable with eliminating anything that stands in their way. The game is made up of small ‘chapters’ that feature a handful of objectives. 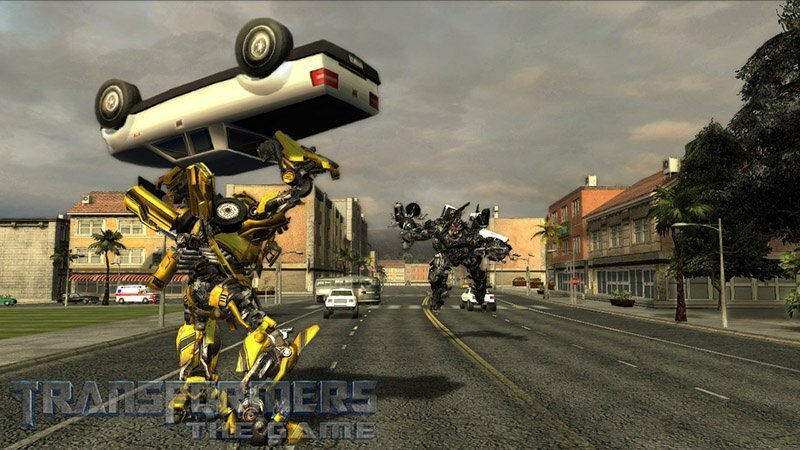 These aims are obviously different depending on which side you swear allegiance to; the Autobots are usually preoccupied with escorting people to safety or ensuring that their enemy doesn’t gain access to certain areas of the map. The Decepticons have a more destructive mentality, and as a result their missions are markedly more enjoyable. Regardless of which side you pick, it’s inevitable that at some juncture you’re going to run into conflict. The combat system is based around four attacks – the most basic is the melee, which is made up of punches and kicks and obviously requires you to be up close and personal with the target of your aggression. Two types of projectile weapons are available – light and heavy, and these are supplemented by the final attack – the ability to pick up random items and hurl them in the direction of undesirables. Within a few minutes of play the weaknesses of the combat system become glaringly apparent. Enemy units possess a shield system that renders your firearms useless. Attacking from a distance often isn’t an option; the only effective way to defeat your opponent is to get in close and engage in a spot of fisticuffs, but even this feels clumsy and counter-intuitive. First, you have to lock onto your target using the Z button on the Nunchuk, then get in close and shake the Wiimote from side to side, thereby raining a series of blows on your foe. Although it sounds simple enough, the ‘lock on’ system is erratic and inaccurate. Instead of cycling from target to target using the Z button you have to actually pinpoint the enemy with the Wiimote’s crosshair before a lock is recognised – so effectively you’re doing twice the work to achieve a decent aim. 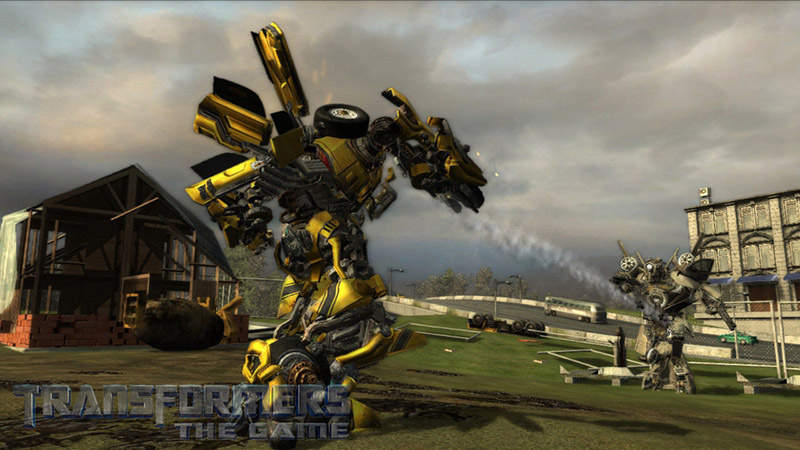 Picking up objects is a more effect way of engaging the enemy from a distance – it would appear that although these combat-hardened robots have advanced defence systems that can repel scorching hot laser fire, they’re unable to deflect a piece of wire fencing or a crumpled lamppost. Absurd it may be, but there is definitely something gratifying about taking an assailant down with a quickly snatched park bench. Even if you are successful in landing a few blows on your opponent, the hyperactive 3D camera is unlikely to give you a decent view of the action. It spins and cavorts around your character with dizzying speed. Because aiming and turning are handled via the Wiimote, things soon degenerate into a battle between the player and the on-screen crosshair. When you swing the Wiimote to activate a melee attack, you’d better make sure you keep a firm grip on the Z button and maintain your viewpoint using the targeting system – should you fail to do this, the display will shake from side to side as the Wiimote follows your hand movement. You can’t blame Traveller’s Tales for seeking to include gesture-sensitive commands in the game, but personally we would have preferred a more basic method. More camera problems occur when shifting from vehicle to robot mode. When driving you only use the Nunchuk – turning is controlled by the analogue stick, acceleration by the Z button and breaking by the C button. When in vehicle mode, the crosshair no longer controls your aim or direction, so moving the Wiimote has no effect. Naturally, you tend to relax your Wiimote-arm when this happens. Unfortunately, as soon as you transform into robot mode (which is awkward in itself thanks to the placement of the d-pad on the controller) the Wiimote is suddenly thrust back into play again and because you’ve instinctively relaxed your aim, the viewpoint goes haywire. It’s not unusual to change to robot mode and find yourself staring at the ground. Needless to say, it’s jarring and off-putting. The negatives are piling up high here, so let’s redress the balance. Regardless of the shortcomings of the controls, the game is often bloody good fun. Combat can be exhilarating (providing you can make the camera behave) and the combination of GTA-style driving with hand-to-hand combat is, for the most part, successful. The ability to climb buildings and leap over obstacles grants a surprising degree of freedom – although the timed missions usually curtail any dreams of exploration you might harbour. Finally, the Transformer characters are well rendered and feel suitably weighty. 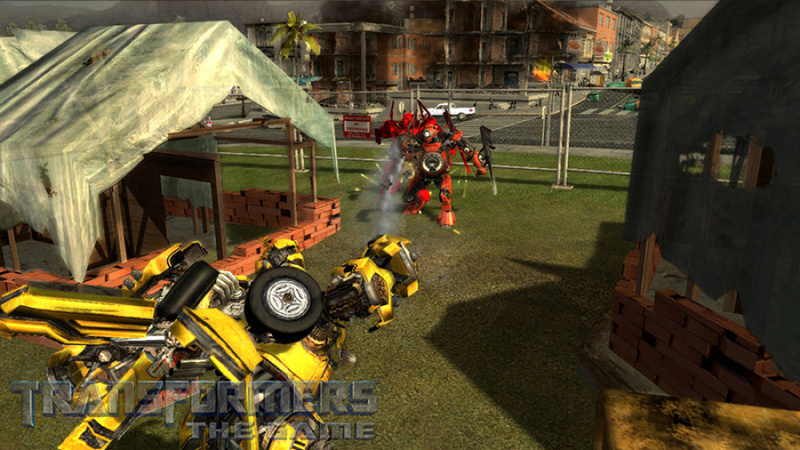 They all have different attributes – Bumbleebee and Barricade are swift but weak, whereas Ironhide and Prime are slower but pack a bigger punch. The most fun is had with the Decepticon Blackout, who can effortlessly take to the skies in his military helicopter mode. The sad fact is that like many games we’ve seen, Transformers is a traditional joypad experience shoehorned into the Wii control system. The abysmal camera and overly complex controls do much to ruin what could have been a thoroughly enjoyable experience. It’s not a terrible game by any means, and once you’ve spend a few hours in its company and gotten used to the foibles of the interface then things become more instinctive – not to mention fun – but other failings, such as clichéd mission objectives, ropey CGI cut scenes and floaty physics – come into play, sullying what might have been an exemplary videogame. 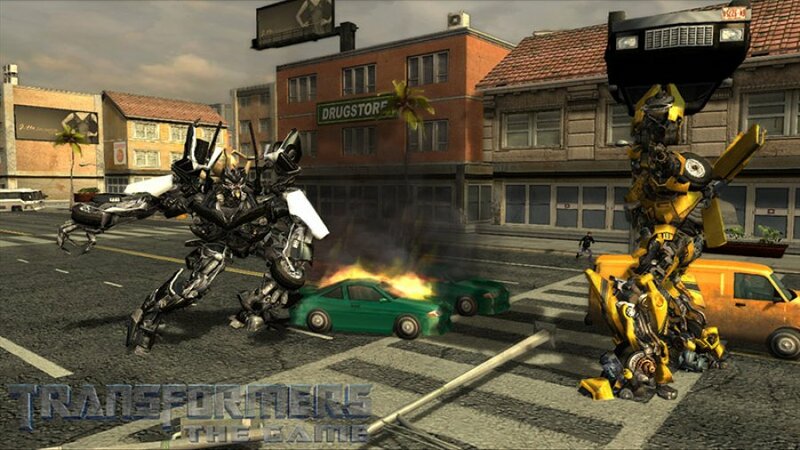 For the time being, Melbourne House's PS2 title Transformers Armada: Prelude to Energon retains the title of ‘Best Transformers Videogame’. Second is a honorable position to comment at. The way you put it, It does sound a little frustrating, and when you Peter "Optimus Prime" was included in the voice-acting was that a compliment or a complaint. Cullen has been doing an excellent job on Optimus for years, though the voice they choose for Megatron is never good until they chose Frank Welker (Scooby-Doo,Fred,Garfield) to do him. I may pass this game, just maybe. Where exactly can I find Transformers Armada, because Push Square won't let me see PS2 games. Nor will it show PSN downloadable games.